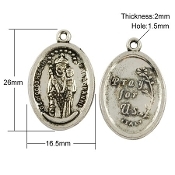 Infant Baby Jesus in Crib Silver Oxidized Medal 1" Italy 25/Pkg St Joseph the Worker/Carpenter Silver oxidized Medal 1"
25/Pkg St Lorenzo Ruiz Silver oxidized Medal 1" Styles Vary Saint Anthony with Praying Hands Antique Gold medal 1"
Antique Gold Medals, a medal coated with an old-fashioned heirloom finish. Its antiqued finish will provide the elegant and classic look of a family heirloom. St Paul the Apostle Silver Oxidized medal oval 1" Our Lady Good of Health Antique Silver Finish Oval Italy 1"